Navadurga (Sanskrit: नवदुर्गा, IAST: Navadurgā, lit. Nine forms of Durga), are nine manifestations of the goddess Durga in Hinduism, especially worshiped during the festival of Navratri where each of the nine manifested forms are venerated respectively for each night. 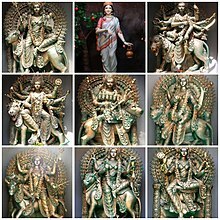 The nine forms of Goddess Durga (seen by some as synonymous with Gauri) or (Parvati) are: Shailaputri, Brahmacharini, Chandraghanta, Kushmanda, Skandamata, Katyayani, Kaalratri, Mahagauri and Siddhidhatri. Each manifestation of Durga is known by her respective name, governing planet, iconography, mantra for invocation (usually repeated 108 times at each sitting during the period of Navratri), dedication day for Navratri and respective prayers. About: After performing self-immolation in her form as Sati, the Mother Goddess took birth in the house of the King of Mountains, as the daughter of Lord Himalaya. Also known as Sati, Bhavani, Parvati or Hemavati, she is the absolute form of Mother Nature and the embodiment of the power of Brahma, Vishnu and Mahadeva. Iconography: Devi Shailaputri is depicted with two hands and has a crescent moon on her forehead. She holds a trident in her right hand & a lotus flower in the left. She rides on mount Nandi (bull). Etymology:"Brahma" means "the one self-existent Spirit, the Absolute Reality, Universal Self, Personal God, the sacred knowledge". "Charini" means "occupation with, engaging, proceeding, behaviour, conduct, to follow, moving within, going after". She is the goddess of asceticism and penance, as her name is the female equivalent of one who practices Brahmacharya. About: Brahmacharini is the Mother Goddess born unto Prajapati Daksha as his daughter Sati and later married Shiva. This is her unmarried, celibate form. Iconography: Walks on bare feet, carrying a japa mala in Her right hand and a kamandalu in Her left hand. About: Chandraghanta is the married form of the Mother Goddess. After getting married to Shiva, she adorned her forehead with a half moon shaped like a bell, which explains the origin of her name. She is the goddess who inspires courage in a person and is always ready for war against demons. When provoked, she can be malevolent to those who invite her wrath, but she remains the embodiment of serenity to her followers. Iconography: Goddess Chandraghanta mounts the tigress. She wears the semi-circular moon(Chandra) on her forehead. The half-moon on her forehead looks like the bell(Ghanta) and hence, Her name. She is depicted with ten hands. Goddess Chandraghanta carries Trishul, Gada, sword and kamandalu in Her four left hands and keeps the fifth left hand in Varadamudra. She carries a lotus flower, arrow, Dhanush and Japa Mala in Her four right hands and keeps the fifth right hand in Abhaya Mudra. Powers: This form of the Mother Goddess is ready for war with all her weapons, to protect the peace and welfare of Her devotees. It is believed that the sound of the moon-bell on her forehead drives all types of evil away from Her devotees. Etymology: Ku means "a little", Ushma means "warmth" or "energy" and Anda means "egg," referring to the cosmic egg. About: After taking the form of Siddhidatri, the Mother Goddess began to live inside the Sun, resulting in liberation of the Sun's energy to the universe. Since then, this form of the Goddess has been known as Kushmanda, namely for her power and capability to live inside the Sun. The glow and radiance of her body is as luminous as that of the Sun. Iconography: Rides on a lioness and has eight hands. She holds a kamandalu, Dhanush, Bada and Kamal in Her right hands. Her left hands hold Amrit Kalash(pot of nectar), japa mala(prayer beads), Gada and Chakra - in that order. Powers: She created the universe in the flash of Her smile and is believed to bestow siddhis(supernatural powers) and niddhis(wealth) to Her devotees. About: Mother of the war god Skanda(Kartikeya). Iconography: Goddess Skandamata mounts the ferocious lion. She is also recognized as "The Goddess of Fire" She carries baby Skanda in her lap. Lord Skanda(also known as Kartikeya or Lord Murugan) is the brother of Ganesha. Goddess Skandamata is depicted with four hands. She carries lotus flowers in Her upper two hands. She holds baby Skanda in one of Her right hands and keeps the other right hand in Abhayamudra. She sits on a lotus flower and because of that, is also known as Goddess Padmasana. Powers: Devotees who worship this form of the Mother Goddess get the added benefit of blessings of Lord Skanda, the God of War(also known as Kartikeya). About: To destroy the demon Mahishasura, the daughter of sage Katyayana was incarnated to help the devas. She is known for her anger, vengeance and ultimate victory over the demons. She will bestow boons upon those who worship and revere her with a pure heart if she is pleased. Iconography: Goddess Katyayani rides on a magnificent lion and is depicted with four hands. She carries a lotus flower and sword in her left hands respectively and keeps her right hands in Abhayamudra and Varadamudras. About: This is the fiercest and the most ferocious form of the Mother Goddess, in which she manifests to destroy the demons Sumbha and Nisumbha. Kalaratri, meaning the night of death (death night). All time, light, emotions, life forms and others all blend into her. She is the death of time and is greater than Kala (time) himself. Iconography: Her complexion is dark black and She rides on a donkey. She is depicted with four hands. Her right hands are in Abhayamudra and Varadamudra. She carries a sword and deadly iron hook in her left hands. Mahagauri is known as the goddess of purity and cleanliness. The man who pleases her, by her grace, all of his flaws, faults and mistakes will be burnt to ashes and he will be redeemed. Siddhidhatri is the one who removes ignorance and she provides the knowledge to realize true reality. The Siddhi that she provides is the realization that only she exists. She is the mistress of all achievements. About: Goddess Shailputri at the age of sixteen was extremely beautiful and blessed with a fair complexion. Due to her extremely fair complexion, she was known as Goddess Mahagauri. Iconography: She rides the bull, just like Goddess Shailputri. She has four arms, holding a Trishul in one of her right hands and depicts the Abhayamudra with the other right hand. She carries a tambourine or Damaru in one left hand and depicts the Varadamudra or kamandalu in her other left hand. Powers: She is known as the forgiving goddess and forgives sinners and purifies them. About: In the beginning of the universe, Lord Rudra worshiped the unmanifest form of the Mother Goddess, Adi Parashakti for creation. As Adi Parashakti, the Mother Goddess was pure energy and had no form. She thus appeared in the form of Siddhidhatri from the left half of Shiva. Iconography: Goddess Siddhidatri sits on a lotus or rides on a lion. She is depicted with four hands. She has gada in the one right hand, a cakram in the other right hand, a lotus flower in the left hand and a shankha in the other left hand. Powers: She bestows all types of siddhi (supernatural powers) to her devotees and hence is worshiped by humans, ghandarvas, asuras and devas alike. ^ "How Goddess Shailaputri teaches us patience and strength". Times of India. 1 October 2016. ^ "Shailputri on drikpanchang". drikpanchang. Retrieved 21 September 2017. ^ "Goddess Skandamata Puja". rgyan.com. Rgyan. Retrieved 27 March 2019. This page was last edited on 11 April 2019, at 12:01 (UTC).